– KICK AND PLAY! Have you ever imagined a toy growing with your baby? Here it is! Our Baby Piano Play Gym provides your child with four different ways to play. While laying & playing, your baby can stare above at a toy arch with bright and funny activity toys. Also he/she can learn to reach out and grab them. Just move the toy arch down for tummy-time play, or let your child sit & play the piano by removing a bar. – PLAY & LEARN! While playing on Baby Play Mat, your child makes more discoveries every single day, and his basic skills continue to become stronger. By kicking the keys, your child can do stretching exercises which enhance her flexibility and motor skills. Sounds of music, bright lights and colors help develop your baby’s sense of hearing and visual abilities. – YOUR BABY CAN LEARN EVEN MORE! 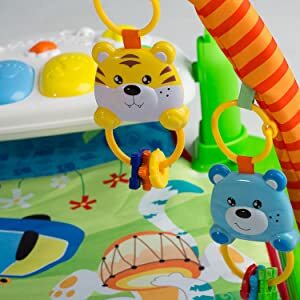 By putting your child’s feet within easy reach of the keys of Baby Play Gym, you help them identify connections between actions and results. All they’ll have to do is kick any piano key to activate the music! – WHAT’S INCLUDED? 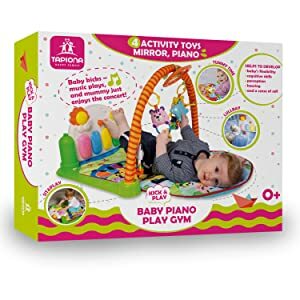 Tapiona Baby Piano Play Mat includes a play mat, a removable baby piano, and a toy bar with 4 activity toys and a mirror. 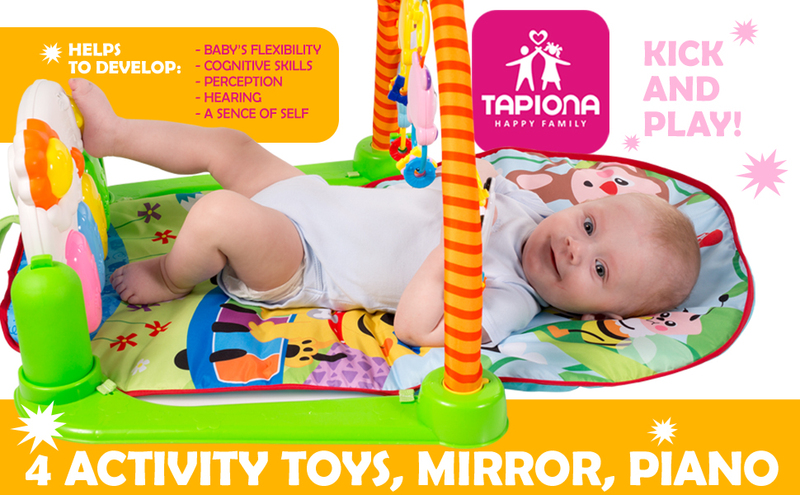 – PLAYNG WITH the Tapiona Infant Activity Mat is your baby’s favorite development-boosting playmate! WHAT’S INCLUDED? Play the Piano Baby Gym includes a baby mat, a removable piano, and a toy bar with 5 activity toys and a mirror. PLAYNG WITH THE TAPIONA BABY PIANO PLAY GYM is your baby’s favorite development-boosting playmate! Tapiona Baby Piano Play Gym Mat comes in a box without excessive packaging materials. Our bright and colorful baby gym brings so much joy to babies! 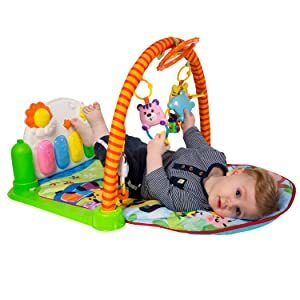 This is everything your baby needs – a play mat for making tummy time fun, a movable toy arch for encouraging your child to touch and grab the toys, and a portable piano to give you and your baby lovable tunes wherever you go! 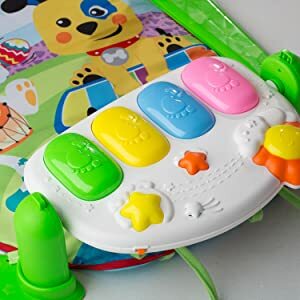 Playing with the Tapiona Baby Piano Play Gym Mat is perfect for any baby! Playing with the Piano Baby Gym is your baby’s favorite development-boosting playmate! Lay & play, tummy-time play, sit & play the piano! Sounds of music, bright lights and a mirror on top of the arch help develop baby’s perception, hearing, and a sense of self. 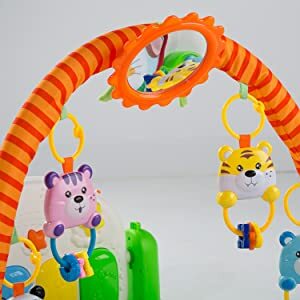 Four activity toys on the overhead and the mirror attract baby’s attention, stimulate motor, vision and grasping skills while grabbing, watching and touching them. Lay & play, tummy-time play, sit & play the piano! Baby kicks – music plays, and Mummy just enjoys the concert!